Voici la nouvelle série de cartes promotionnelles disponibles dans les tournois japonais ! 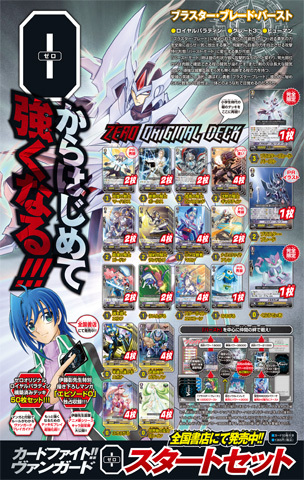 Here is the new promo card series, which are available in japanese tournaments ! [AUTO]:[Counter Blast (1)] When this unit is placed on (VC) or (RC), if you have an «Oracle Think Tank» vanguard, you may pay the cost. If you do, put the top card of your deck into your damage zone, and at the beginning of your end phase, choose a card from your damage zone, return it to your deck, and shuffle your deck. [AUTO](VC) Limit Break 4 (This ability is active if you have four or more damage):[Choose one of your rear-guards with « Revenger » in its card name, and retire it] When this unit attacks a vanguard, you may pay the cost. If you do, this unit [Power]+5000/[Critical]+1 until end of that battle. [ACT](VC) Limit Break 4 (This ability is active if you have four or more damage):[Counter Blast (1) – Cards with Star-Vader in its card name] Choose one of your opponent’s rear-guard in the back row, and lock it. [AUTO](VC):When this unit attacks, if the number of rear-guards you have is more than your opponent’s, this unit gets [Power]+3000 until end of that battle. [CONT](VC/RC):If the number of «Dark Irregulars» in your soul is ten or more, this unit gets [Power]+4000. [AUTO](VC/RC): When this unit’s attack hits a vanguard, if you have an «Aqua Force» vanguard, choose a card from your damage zone, and turn it face up. AUTO (VC/RC): When this unit attacks, if the number of cards in your hand is greater than your opponent’s, this unit gets Power +3000 until end of that battle. AUTO (VC): When this unit’s drive check reveals a Grade 3 « Kagero », this unit gets Power +5000 until the end of that battle. ACT (RC): [Retire this Unit] Choose 1 of your Opponent’s Grade 0 Rear Guards and retire it. AUTO (VC/RC): [Soul Blast (1)] When this Unit attacks, and you have a « Kagero », Vanguard, you may pay the cost. If so, during that turn, this Unit gains +3000 Power. AUTO (VC/RC): [Soul Blast (1)] When this Unit attacks, and you have a « Royal Paladin », Vanguard, you may pay the cost. If so, during that turn, this Unit gains +3000 Power. AUTO: When this unit is placed on Vanguard Circle or Rear-guard Circle, if you have an «Oracle Think Tank» vanguard, look at the top card of your deck, and put that card on top of your deck.